In our career we delivered speeches in hundreds of customer conferences, round tables and seminar series and we wrote so many articles. Given that expertise, we can be engaged in writing columns for you (being your ghost writer) and to jointly author articles to be published on the national ad international press. We can also interview your management and this can be advertized on social networks. 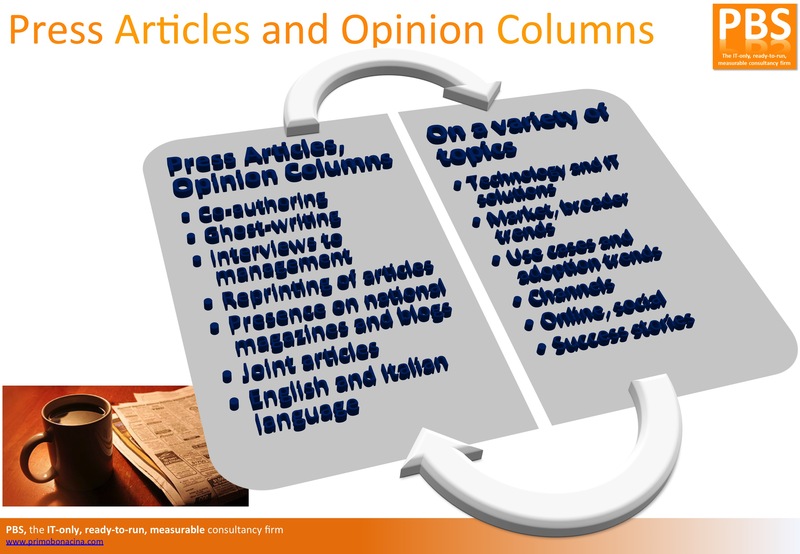 Moreover, as we write columns on the national press (offline and online) on a variety of trends, these articles can be made available as content to you and your online properties. We can also author joint articles. Finally, www.primobonacina.com is a primary IT blog, followed by a number of subscribers and with thousands of page visits per month. You can take benefit of this blog and its associated social network to make the market aware of your initiatives. Here follows more info. Click on the image below to enlarge it!